The Lion King has extended its booking in London’s West End to 1 October 2017. The Play That Goes Wrong has extended its booking at the West End’s Duchess Theatre to 25 February 2018. The Girls, have announced that the show has extended its booking at the Phoenix Theatre to 15 July 2017. Long running West End thriller The Woman in Black is now booking to 3 March 2018. 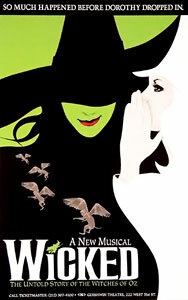 Wicked is a musical with songs and lyrics by Stephen Schwartz and book by Winnie Holzman. The story is loosely based on the best-selling novel Wicked: The Life and Times of the Wicked Witch of the West by Gregory Maguire, a parallel novel of the 1939 film of L. Frank Baum’s classic story The Wonderful Wizard of Oz from the perspective of the witches of the Land of Oz. It is currently the eighteenth longest-running show in Broadway history and the twenty-fifth longest-running show in musical theatre history.